Looking for something specific? Use the search button in the upper right! I use a lot of common mold names in the titles. Any questions, shoot me an email! Happy Shopping! I hope everyone is staying warm! This time of year is chilly chilly, and here in Virginia it's no different! There will be very few Silly Horses offered this month due to the weather but I'm hoping April is a totally different story. And don't forget to visit the CATCH ALL page! It's loaded down with marked down goodies as I continue with my studio cleanup. Very cool Variations! Lots of Breyers added, with more coming!! New Seasonal Silly Horses Added! 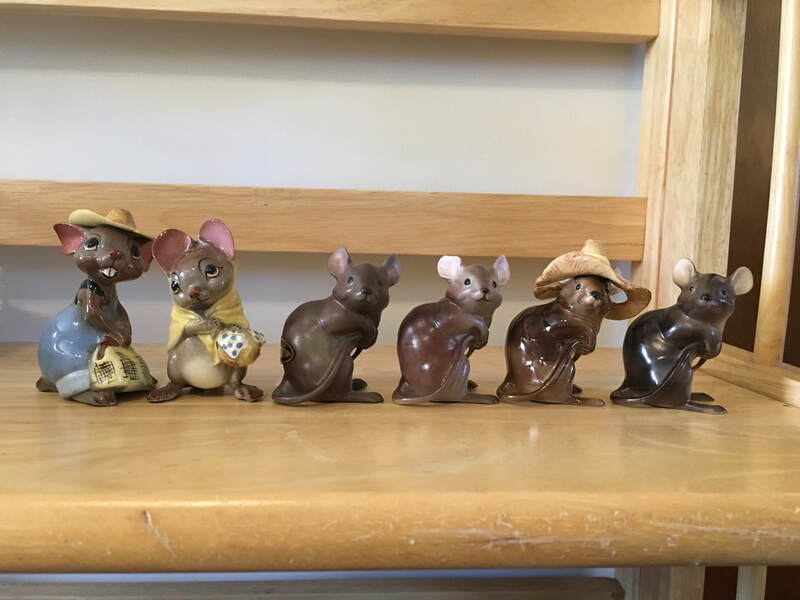 I got a mouse Problem! Check out the Hagen Renaker DW Page for new additions! Orders are usually shipped within 3 business days. Occasionally there is a delay, but I try to have everything shipped as quickly as possible. I do not. I appreciate any interest in my work, however, I find that the stress of trying to get a piece custom made for someone is more than I can deal with and still enjoy the flow of art. The only 'custom order' I do is if someone wanted several silly horses that were all exactly the same. I am, however, always open to ideas of what people would like to see in future products. DO YOU TAKE TIME PAYMENTS? The website is not set up to do time payments, if you need them, please let me know the item(s) you are interested in, and time frame you have in mind. I try to be flexible, I've bought so many pieces on time payments myself. I do prefer to limit them to 3 months long, and total combined orders of $100 or more. how often do you add new items for sale? Normally I post new items for sale around the start of every month. I update my site in the middle of the month, removing sold products, general tweaking, ect. This way I can focus more on creating new pieces and less time on fixing and uploading my website. However, from Oct-Dec. I anticipate adding pieces throughout the month as they are completed. My shipping quote dosen't seem correct? This entire site is made by myself, and I'm far from a website master lol. Silly horses ship first class unless there are too many weight wise. They ship free with larger pieces. The larger horses are $10-15 per horse to ship, due to size and weight. If when I go to print your label, and the site charged you $10 to ship your silly horses, and it costs less than $4, you will receive a $6 refund. My apologies for this, I'm still trying to figure out how to work it best.